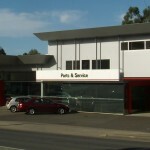 Adelaide Hills Toyota, Mount Barker, S.A. This is a renovation of a showroom and workshops, parts of which dated from the early twentieth century. Large areas of glass now allow the showroom to be flooded with daylight (while motorists on the main road get tantalising glimpses of the gorgeous vehicles on display). 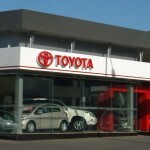 A large new workshop, offices and staff amenities were added to the existing building enhance the firm’s service capacity; external style and finishes are Toyota house standard, but the architectonic of the whole group is a pleasing addition to Mount Barker’s main entry.